Installing applications on Mac OS X is quite easy compared to many other platforms, allthough it is somewhat different from other platforms. Below we list the steps needed for basic installation an uninstallation. Don't install a development build unless you are willing to experience bugs, changes, breaks, sudden movements, fire, and other things that might "be bumpy". Kodi is installed by drag-and-dropping it to the applications folder. Recommended - Right click (or command+click) the Kodi icon and select "open"
Where it says "Allow applications downloaded from:" select "Anywhere"
OS X will give you a scary warning that is a bit exaggerated. If you're not comfortable with this, use the "right click" method mentioned above. In all cases OS X will still ask you if you want to open an "unsigned" application the first time it is opened, so new applications that are downloaded can't just start by themselves. This can be done by using the eject icon next to to it in the Finder sidebar as if it were a CD. You can also drag the mounted disk icon to the the Trash, again as if it were a CD. All files other than the bundle in the Applications folder can be simply discarded. Either place them in the Trash or back them up somewhere in case you wish to re-install the application in the future. 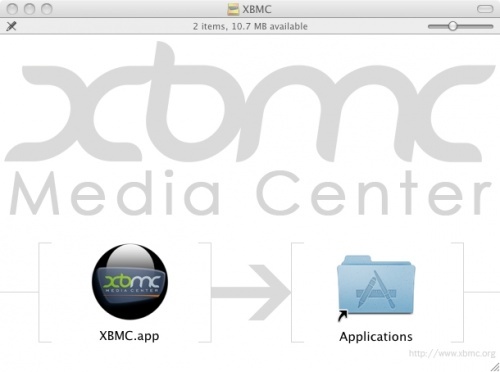 To update Kodi for Mac simply follow the normal install steps with the newer version. All your settings and files will be preserved as they are located in a different place in the userdata folder. Be sure to make a backup of the userdata folder when doing updates in case something goes wrong. The Kodi bundle contains the full application. This means that to uninstall it, you only have to drag it to the Trash. 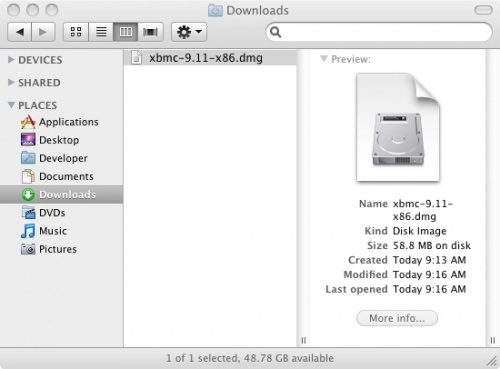 Note: The "Library" folder for your user is hidden by default in Mac OS X. See here for how to expose this folder if you don't already know how to. This directory contains all your settings and your video & music database. If you want to remove all your Kodi settings, drag this folder to the Trash. Go into System Preferences, select "accounts". Select "Login Items", at the bottom hit the plus button and then a drop down box allows you to select Kodi. Alternatively, if you have the app open in your dock, you can right-click/click-and-hold the icon and choose "Open at Log-in"
After this, the application will start up automatically after you log in. This page was last edited on 10 March 2018, at 09:41.